It’s unclear when the Sony Sports boombox became my must-have gadget, but I think it was around 1992. With its bright yellow case, the portable music machine could be spotted from across the pool like a big bright sign that screamed, “I am rugged and cool!” I wanted one for all the wrong reasons, and now, it’s strange to feel similar rumblings about Sony’s new, waterproof Bluetooth speaker. 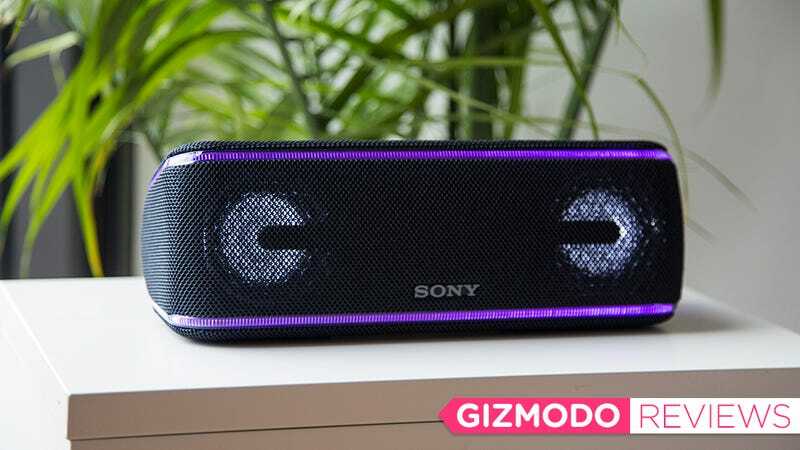 The $250 Sony SRS-XB41 looks like a regular old wireless speaker until you turn it on and hit play. At that time, you’ll feel your eyebrows raise as a thin strip of multicolored LED lights illuminates the edges of the mesh box as the drivers light up white and a set of strobes blink on either side. At a recent press event in New York City, a Sony rep referenced the popularity of EDM music as a reason why the company tried to put the club experience into a device the size of a large bottle of Yellow Tail Pinot Grigio. A few minutes later, the rep dunked the XB41 into an aquarium, lights still blinking and music still bumping. This speaker was something else. In two weeks of testing, I can report that the XB41 does indeed light up as advertised, and it does play EDM music with a bass-heavy tuning that will please a desensitized teen. As I sat next to the thing alone in my living room, I wondered if young people really wanted their wireless speaker to flicker like a fire alarm. I know that they’d like the new IP67 rating that indicates not only its resistance to dust and sand but also its ability to stay submerged in up to three feet of water for at least 30 minutes. You can throw this thing in the ocean, listen to six Diplo songs and then retrieve it without worrying about its survival. Diplo even sounds extra Diplo thanks to the EXTRA BASS™, one of several branded audio features available on the speaker. Sony actually puts one newish audio feature right on the main controls: Live Sound. This is a little technology trick that switches from the standard tuning to the illusion that you’re listening to your music at a live event, one that uses angled drives to project the sound in all directions. Sony likens it to “a real three-dimensional audio experience,” although it really just sounds like a lot of reverb to me. That said, like the stressful light show, you don’t have to use it. While you have to turn off the lights in the settings of the Sony Music Center app, you can avoid the Live Sound mode simply by not pushing the button. So let’s pretend you’re a boring middle-aged music lover like me, and you just want to sit on the deck and listen to Kenny Rogers. 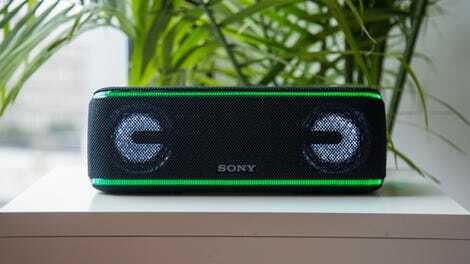 This Sony speaker is not bad for that! The speaker defaults to EXTRA BASS which is indeed a little extra, in my opinion. Once you turn that off and avoid avoid Live Sound altogether, the XB41 sounds very satisfactory. I’d compare the audio fidelity to the similarly featured UE Megablast, which also happens to be one of my favorite gadgets ever. Kenny Rogers sounds crisp and angelic on “Islands in the Stream.” Diplo sounds dreamy and nicely detailed on his under appreciated 2004 solo album Florida. You can also turn the bass back up and thump to his new album California, which is not as nuanced but also good, I guess. While it delivers on sound quality, I must admit that the Sony XB41 lets me down on controls. There are too many! The top of the speaker has six buttons for basic controls, including the dedicated Live Sound toggle. Around back, there’s a little rubber, waterproofed door that opens up to reveal three more buttons you don’t need as well as four ports, two of which (headphone jack and charge) are necessary and two of which (DC input and USB charging port) are overkill. Speaking of overkill, there’s also a feature called Party Booster that lets you bang on the speaker to create sound effects. You can pair this with another Sony app called Fiestable to control the lighting and add even more DJ effects. It’s all a lot for my mid-30s to handle, but like I said earlier, the kids might love it. I loved the Sony Sports Mega Bass boombox back in the 90s because it could do a lot of stuff. It wasn’t quite waterproof, but it did have those rubber buttons that made it seem like it was. Plus, it was so yellow and screamed party at all times. At least it did to my friends and I, all of whom like to hang out at the river and throw rocks. The Sony XB41 is a 21st century version of that, albeit with a different definition of party. While you (or your kids) might like the strobe lights and the Party Booster sounds and the Live Sound pretend-you’re-at-a-festival effect, the XB41 is still a terrific Bluetooth speaker, if you don’t use any of those features. Personally, I recommend you don’t, in which case you might consider the UE Megablast which looks nicer, has simpler controls, and works with Alexa. It’s also $300. The Megablast is worth the extra $50 to me. But if you’re a Sony lover who might be a little nostalgic for your old boombox, the XB41 is worth a look. It might take you back to your youth and your time at the club, if that’s what you did. And depending on how that went, that might be a good trip.